Maple Butter Roast Turkey/Best Turkey You’ll Ever Eat In Your Life. 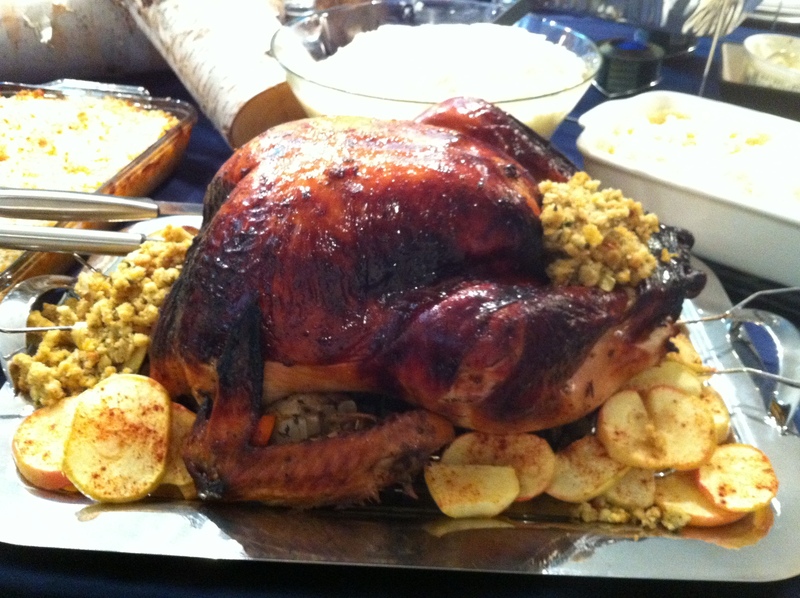 As I promised you guys last week, today’s blog post is all about my famous Maple Butter turkey. I say famous because I cook it exactly twice per year (Thanksgiving and Christmukah dinner), for crowds of 12-25 people, and each one of those people claim it’s the best turkey they’ve ever had. I’m really not exaggerating here – this turkey is everything turkey should be but usually isn’t – moist and juicy (I’m not kidding when I say that you need to be careful when first carving it, as the juices will squirt out at your face), flavourful and delicious with an amazingly sweet gravy. Now, you’ll have to excuse the photos as they’re from last Chrismukkah (yes, that’s Christmas and Chanukah rolled into one), but I will update them after this Thanksgiving. For Canadian folks like me, we’re just about one week away from Thanksgiving, which means ORDER YOUR TURKEY! Oh, and bookmark this recipe because if you’re hosting this year, you’ll need it. Now I have to warn you, this is a not so lazy lazygirl recipe, but it is 100% worth it. I promise. The trick is to thoroughly coat the inside and outside of the bird with the maple butter – I mean, you’re gonna have to get super personal – and baste the bird about every 30 minutes. The smell in your house alone will drive you crazy. If this is your first time cooking a turkey and you’re nervous, don’t be. The first time I made it, it was amazing, and it has been consistently amazing every time after that – you just can’t really mess it up with this recipe. So go on, take that bold step and volunteer to cook a bird this year. You’ll be glad you did. Preheat oven to 375 degrees F (190 degrees C). Place rack in lower third of oven. Place turkey on a rack set in a roasting pan. Reserve 1/4 cup maple butter for gravy, and rub the remaining maple butter under the skin of the breast and over the outside of turkey (like I said, get intimate with this turkey and make sure every nook and cranny is coated in the maple butter). Spoon the stuffing into the cavities, careful not to overstuff. Arrange onion, carrots, turkey neck and giblets (if desired – I usually omit the giblets because they scare me) around the turkey. Sprinkle 1 tablespoon thyme and 1 tablespoon marjoram over vegetables. Pour 2 cups broth into pan. Roast turkey for 30 minutes in the preheated oven. Reduce oven temperature to 350 degrees F (175 degrees C). Cover entire turkey loosely with foil. Continue roasting for about 2 1/2 hours, basting the bird with the drippings/broth every 30 minutes. The turkey is ready when a meat thermometer inserted into thickest part of thigh registers 180 degrees F (85 degrees C). Once done, transfer turkey to platter, and let stand 30 minutes. Strain the pan juices into a large measuring cup, and then remove any excess fat. Add enough chicken broth to pan juices to measure 3 cups. Transfer liquid to a saucepan, and bring to boil. In a small bowl, mix 1/4 cup maple butter and 1/3 cup flour until smooth. Whisk flour and butter mixture into broth mixture. Stir in remaining thyme and the bay leaf. Boil until reduced to sauce consistency, stirring occasionally, about 10 minutes. Season with salt and pepper to taste. To serve, I like to grill some apples sprinkled with cinnamon and arrange them around the turkey, along with extra stuffing. The gravy is amazing alone over the turkey, but I also like to spoon on some cranberry sauce – the flavours are incredible together. Get ready to become a rockstar at your holiday dinners from now on, because after you make this turkey, you will be known as the official turkey maker of your family/friends/workplace.